More than 4,000 varieties of native potatoes grow in the Andean highlands of Peru, Boliva, and Ecuador. well adapted to the harsh conditions that prevail in the high Andes, at altitudes ranging from 3,500 to 4,200 meters. Farmers generally produce these native varieties with minimal or no use of agrochemicals. Diversity is conserved on farms and in communities for subsistence use and as a highly valued heritage. Most of these varieties never see a market; they are traded among highland and lowland communities and given as gifts for weddings and other occasions. The varieties differ from community to community. It is believed that wild tubers were first domesticated around 8,000 years ago by farmers who lived on the high plains and mountain slopes near Lake Titicaca, which borders modern-day Bolivia and Peru. The tubers grew well in the cold, harsh climate and quickly took root as a centerpiece around which life revolved. View photos of Andean potato farm families and vibrant images of native potato diversity (begins on page 52) in this catalog. There are 151 known species of wild potato. These inedible species are the original ancestors of today’s cultivated potato. Wild species are found from southwestern United States to southern Chile, with most species concentrated in Peru and Bolivia. They grow in diverse soils and climates, from the dry desert along the Peruvian coast, to the inter-Andean valleys, up to altitudes of 4,200 meters above sea level. 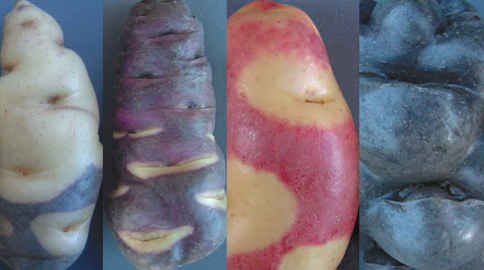 Wild tubers are smaller than cultivated potatoes and come in a variety of shapes and colors. Unlike cultivated potatoes, which have lost genetic variation through domestication, their crop wild relatives (CWR) are a rich source of traits that can be used to breed more nutritious, disease-resistant varieties. Temperature change coupled with loss of habitat is the greatest threat to wild potato species. Recent modeling studies show that by 2050 as many as 13 wild potato species may become extinct, and up to 52% of distribution area lost. Safeguarding these genetic resources is vital to efforts to mitigate the impacts of climate change on potato crops. The CIP genebank holds 140 of the 151 known wild potato species. When Darwin reached Guayteca Island on the Chilean archipelago of Los Chonos, he noted an abundance of wild potato. “The tallest plant was four feet in height. The tubers were generally small, but I found one of an oval shape, two inches in diameter: they resembled in every respect, and had the same smell as English potatoes; but when boiled they shrunk much and were watery and insipid.” More than 130 years later in 1969, legendary Peruvian plant explorer Carlos Ochoa entered a cave on the same island and found the same potato described by the author of On the Origin of Species. In honor of Ochoa’s discovery, the species was named Solanum ochoanum. Ochoa theorized that this potato had at some time been cultivated and then grew wild, because it features the same chromosomes and a similar morphology as Solanum tuberosum, our modern potato. He believed that 19th century fishermen may have transported the tuber from the mainland for their own consumption to prevent scurvy. Because S. ochoanum has adapted to soils with high salt concentrations, it could prove useful in providing genes to breeding programs for parts of the world that suffer from high soil salinity.